One of the best breakfasts I had in Hong Kong was at Kam Wah Cafe. 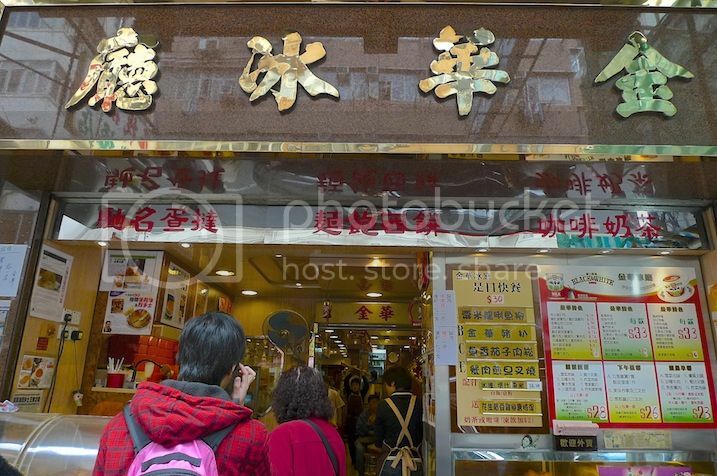 Located at 47, Bute Street in Mongkok, Kam Wah Cafe is a very well known and popular cha chaan teng in Hong Kong. 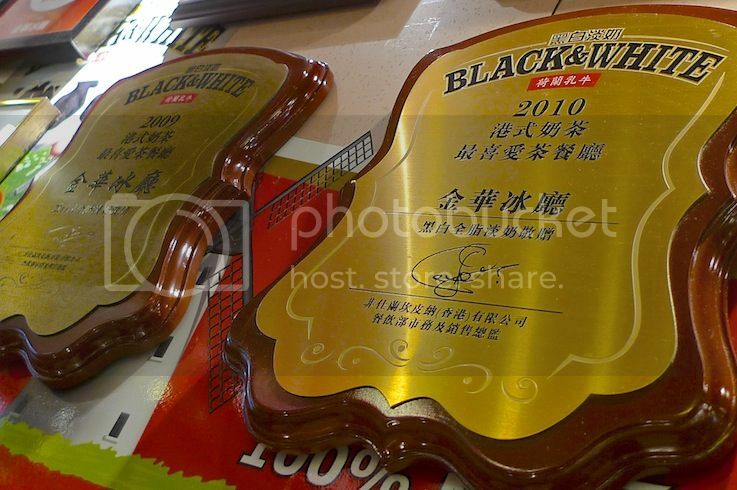 It is even patronized by famous Hong Kong TVB stars! 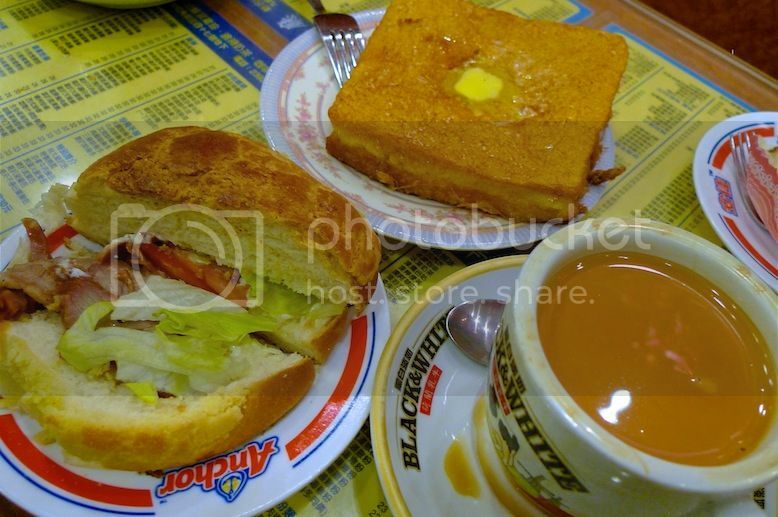 Cha chaan teng, by the way, is something like a cafe or local eatery in Hong Kong that serves comfort food at reasonable prices. They can be found almost everywhere in the streets of Hong Kong and the locals love to go there for their breakfast, lunch, tea and even dinner! On my 5th day in Hong Kong, my friend and I decided to check out this famous cafe. We had planned to visit the Big Buddha and Po Lin Monastery in Lantau Island that day, so we decided to wake up early for a good breakfast before the trip. 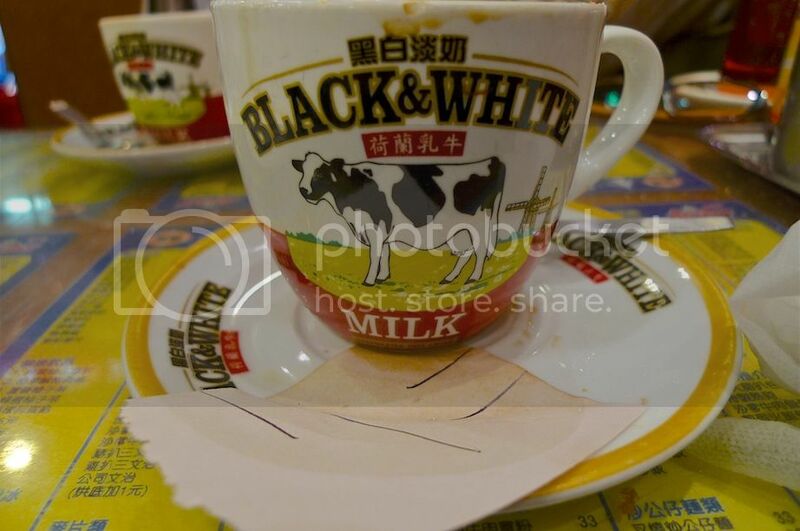 The cafe was quite full but not full enough for my friend and I to share table with others like what we did at another excellent cha chaan teng - Australia Dairy Company. Read about it HERE. 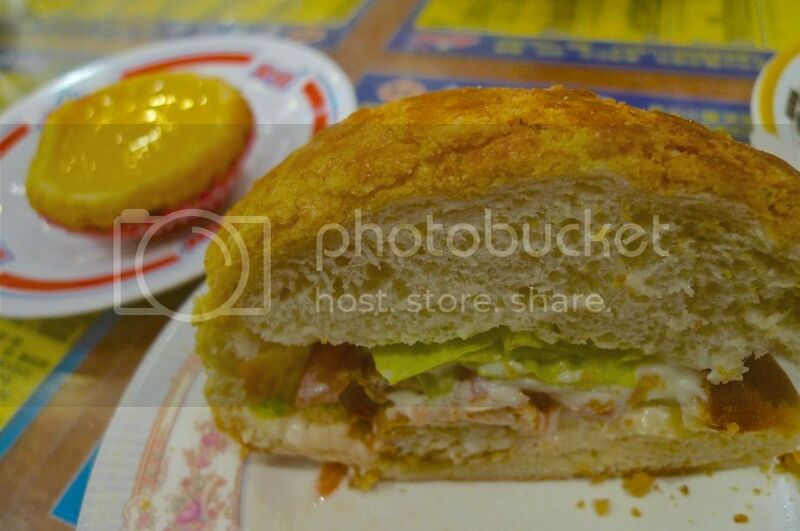 Kam Wah Cafe is famous for their polo bao (also spelt as boluo bao lit. pineapple bun) so that was something we made sure we order. 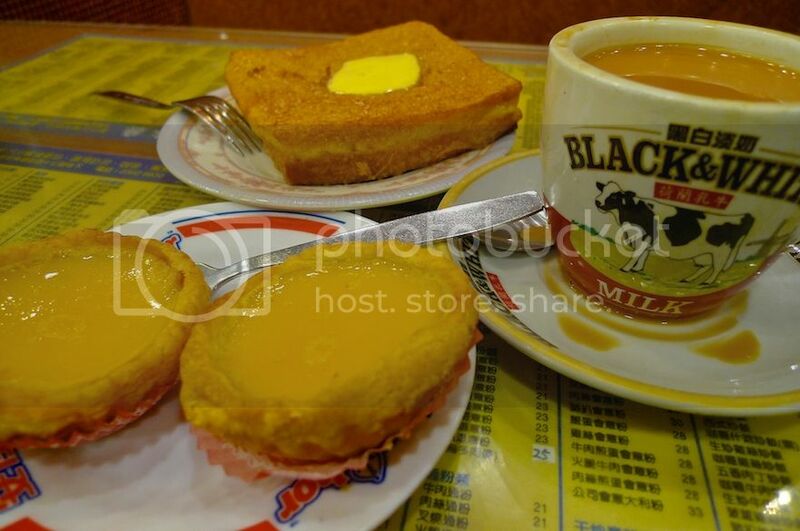 We also ordered their egg tarts and milk tea. The egg tart was one of the most delicious I have ever eaten! The filling was soft and smooth and the thickness of the crust was just right. 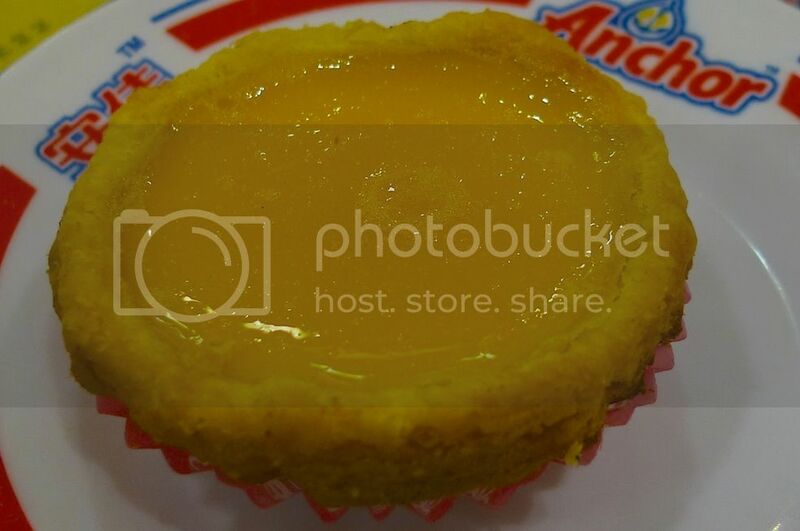 Definitely beats Malaysia's famous Tong Kee egg tarts in my opinion. The polo bun was absolutely awesome! Crispy on the outside and fluffy on the inside, it was the best polo bun I have ever eaten in my life! No kidding! For the uninitiated, there is no pineapple in the polo bun. 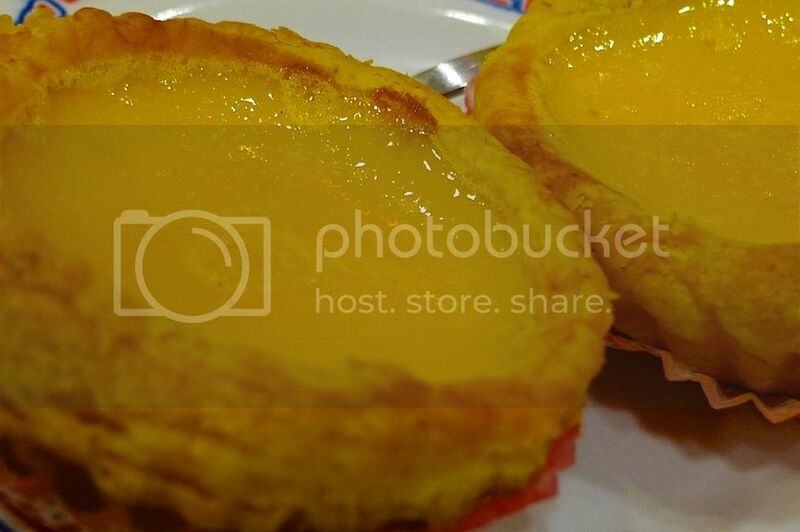 It is so called because the top of the bun resembles pineapple skin. So please do not search for the pineapple and make the mistake of asking the waiter where the pineapple is. LOL! There are many ways to eat this polo bun. You can just eat it plain as it's slightly sweet on its own. Or you can eat it with eggs sandwiched in the middle. But the most delicious is to eat it with salted butter! 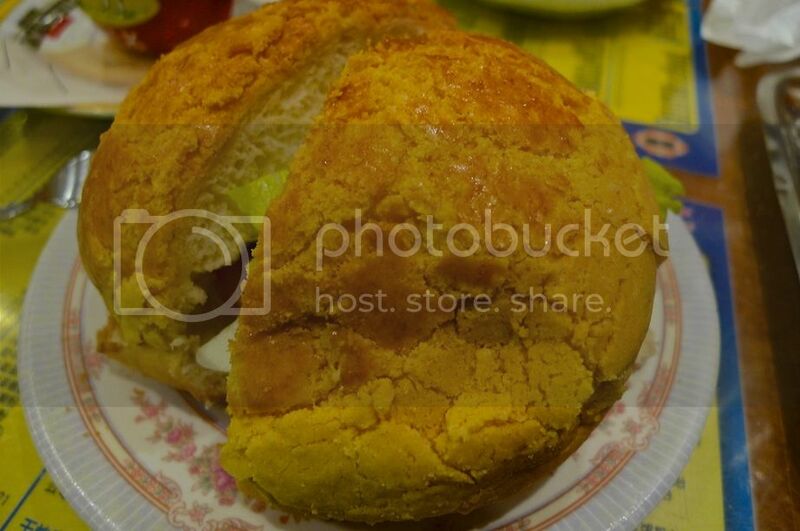 Polo bao with a thick slab of butter wedged in the center is known as polo yau. This can be found in a lot of cafes throughout Hong Kong, but the best is probably at Kam Wah Cafe. Somehow, the saltiness of the butter mixed with the sweetness of the polo bun's crust makes it taste oh, so heavenly. Gosh, I'm drooling even as I'm writing this! I've forgotten to take a photo of the polo yau - must be too hungry that I gobbled it up before realizing I did not take a shot! LOL! 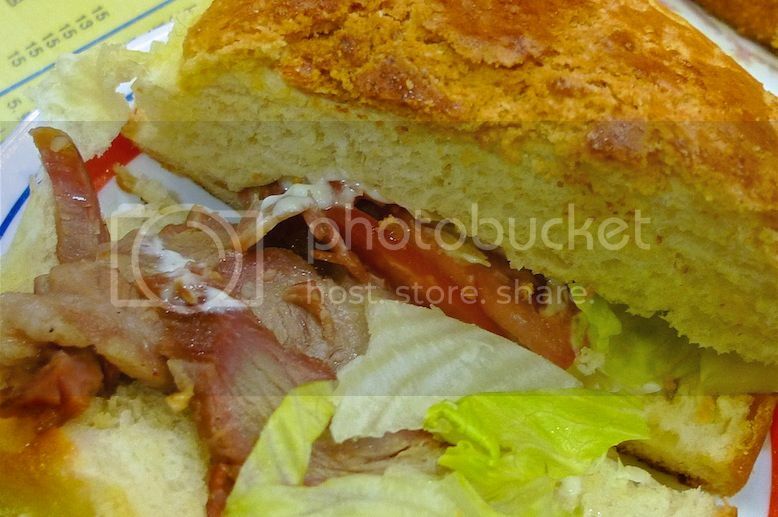 We also ate another version of polo bun which came with char siew (barbecued pork), shredded lettuce and mayonnaise sauce. It was super delicious!! But I still think nothing beats the simple polo yau. By the way, they provide forks for you to eat the polo bun. You need the fork to press down and compress the bun before putting in your mouth. At least that's how I see the locals eat their polo buns. Please do not use your hand and eat it like you are eating a McDonald's burger. LOL! As for the milk tea, I have tasted many milk teas in Hong Kong during my trip and I have to say this one is the best so far!! Of course I have not been to enough places to say it's really the best, but I think you will not be disappointed with the milk tea at Kam Wah. Their milk tea has strong tea aroma and very smooth on the throat. It's also not sweet because they use evaporated milk, not sweet condensed milk. For me, it was even better than the one I drank at Australia Dairy Company which is another cafe I highly recommend. The brand of milk they use is the Black & White Milk from Holland as seen from the cups and also the plaques hanging on the wall. By the way, I have to say that the pairing of the milk tea and the polo bun was just perfect! Add an egg tart to this combination and you will have the most delightful breakfast ever! I've forgotten the price but I think this set (picture below) will not cost you more than HK$50 (US$6.50 / RM21.00). My friend and I were so satisfied with our meal here that we decided to return for breakfast again the next day! One thing good about Kam Wah Cafe is that despite being crowded most of the time, the service is prompt and the waiters and waitresses are not rude, unlike in many other eateries in Hong Kong. It was our 6th and last day in Hong Kong, so we made absolutely sure we would not miss another round of breakfast at Kam Wah Cafe. 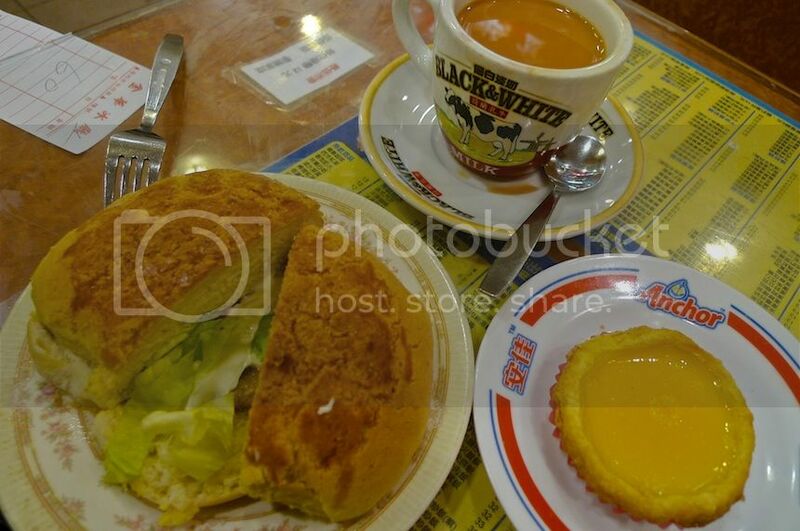 This time, we went for egg tarts, thick toast and milk tea. The egg tarts were so delicious I was tempted to take away some but in the end, I did not. 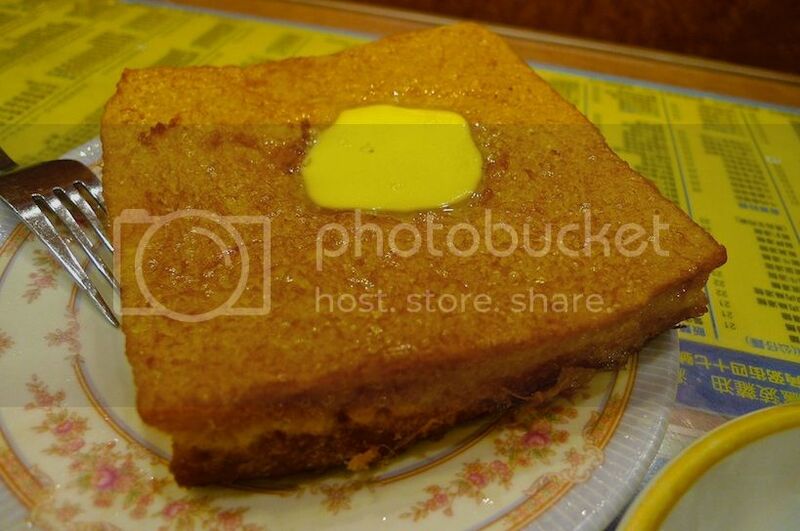 The thick toast came with melted butter. This was not my favorite as I felt it was too unhealthy with the excess fat, sugar and oil. Of course, we also ordered the polo bun. How could we not? LOL! I heard that pork lard were used for the top crust of this polo bun - probably that explains why it was so delicious! Further more, it was no ordinary pork lard. The pork lard was imported all the way from Holland! 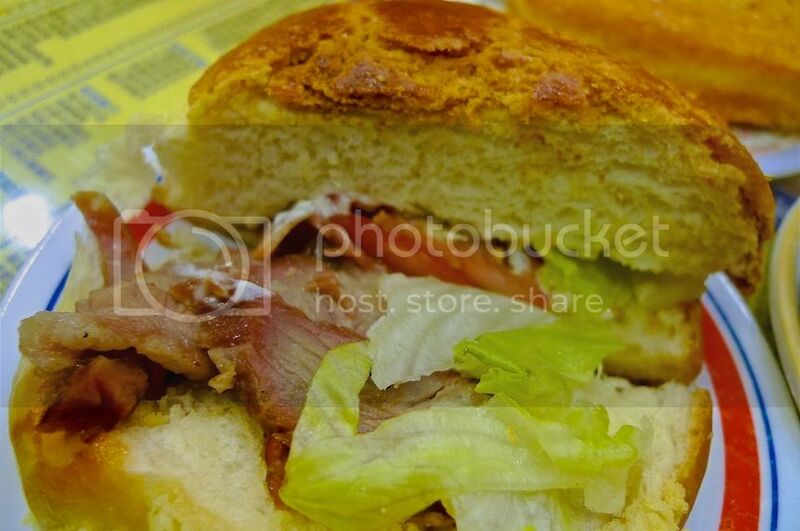 Can you see the char siew (barbecued pork) and shredded lettuce with some mayonnaise sauce? Yummy! 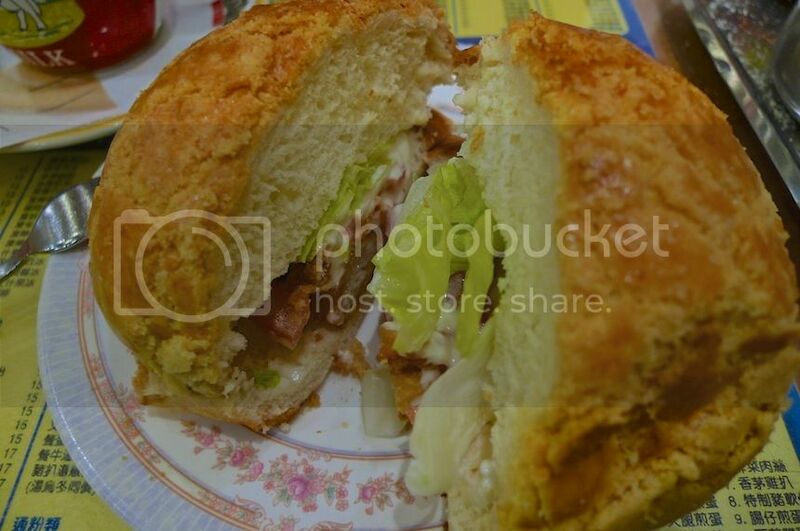 If you only eat ONE thing at Kam Wah Cafe, make sure it's the polo bun! Besides the polo buns and egg tarts, the cafe also serves noodles, macaroni and ham in soup, and also instant noodles with luncheon meat and egg which the locals seem to love so much. 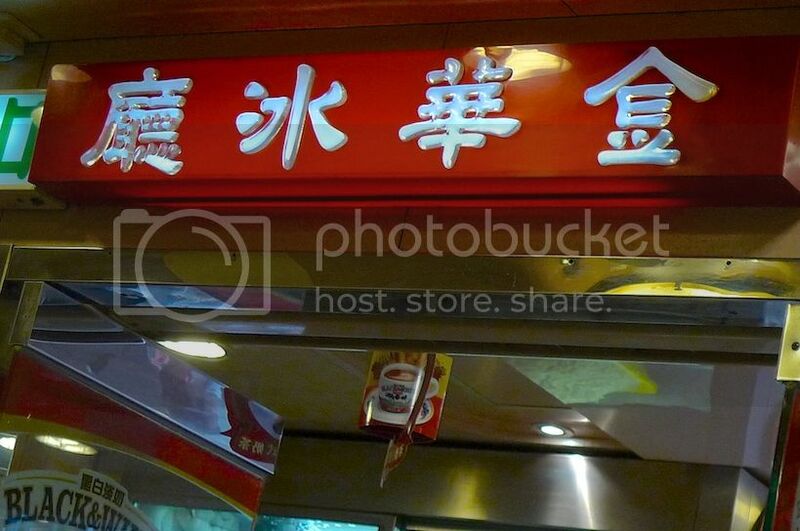 There's also a counter at the shop front where you can buy the buns and egg tarts for take-away. I missed the Hong Kong polo buns and milk tea so much that when I came back to Malaysia, I went on a desperate search for them. Unfortunately, I could not find any that could match the quality and taste of the ones I had in Hong Kong. The polo bun I had at OldTown White Coffee was horrendous to say the least, and the milk tea was no where near the Hong Kong standards. Even the polo buns sold at most bakery shops were far from good. 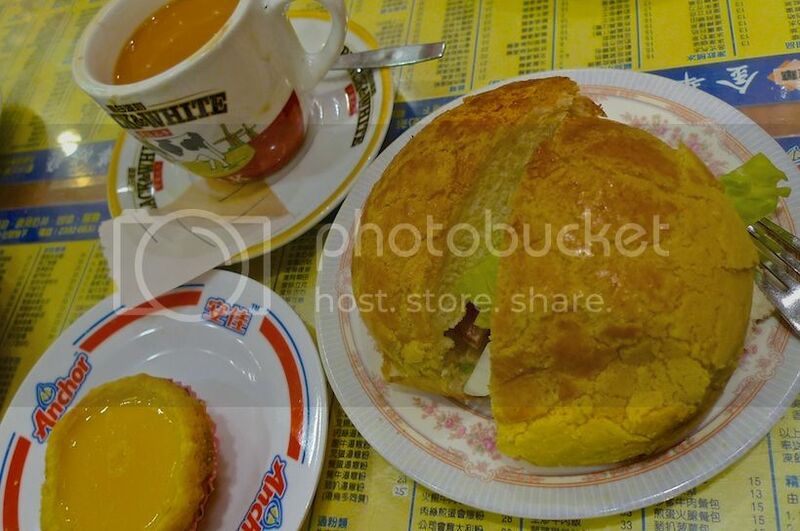 Looks like I have to fly to Hong Kong again just for their yummy polo buns, egg tarts and milk tea! If you ever go Hong Kong, do not miss this Kam Wah Cafe. It may not be the best cafe in Hong Kong, but it's absolutely one of the very best!